Based upon proven technology, the Quickie RXS gives you the peace of mind and reassurance of its performance time and time again. Now, the 'standard' has been raised even higher with the recent inclusions of extra frame colour options and accessories. The Quickie RXS is now more configurable and can truly be tailored and adjusted to your precise needs and wants. Therefore, if you are looking for a folding wheelchair that will bring both comfort and confidence, the RXS is the chair for you. Vertical axle Plate: Infinite centre point of gravity, seat height & seat angle adj. achieved with slotted vertical axle plate. 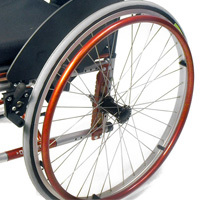 Active Wheel Lock: Offers improved looks, less weight and gives more space for sideways transfers out of the wheelchair. 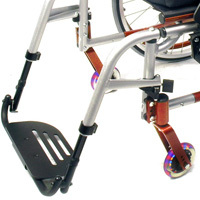 Offers improved looks, less weight and gives more space for sideways transfers out of the wheelchair. 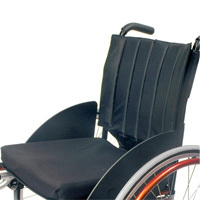 Folding strap: Makes folding of the wheelchair easier. Swing away armrests std. Easy for side transfers, lightweight & detachable. 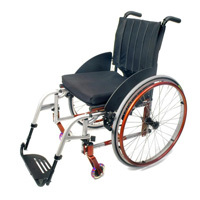 Optional height adjustable or tool height adjustable armrests, plastic side guards or fender guards. Swing away detachable footrests std. Easy for standing transfers, Compact for transportation. 60, 70 & 90° & 70° V hanger angles with ELR. Quick release mag or spoke wheels. Pneumatic or solid rear tyres. 8x1, 8x2, or 6" castors.